Riverrun creates a sound environment in which stasis and flux, solidity and movement co-exist in a dynamic balance. The corresponding metaphor is that of a river, always moving yet seemingly permanent. From the smallest rivulet to the fullest force of its mass, a river is formed from a collection of countless droplets and sources. So too with the sound in this composition which bases itself on the smallest possible 'unit' of sound in order to create larger textures and masses. The title is the first word in James Joyce's Finnegan's Wake. Riverrun is entirely realized with the method of sound production known as granular synthesis. With this method small units or 'grains' of sound are produced, usually with very high densities (100-2000 grains/sec), with each grain having a separately defined frequency and duration. When the grains all have similar parameters, the result is a pitched and amplitude modulated sound, but when random variation is allowed in a parameter, a broad-band noise component is introduced. All sounds in this piece were generated with real-time synthesis by the DMX-1000 Digital Signal Processor, up to a maximum density of 2375 grains/second. However, in many cases, lesser densities were also used since often the progression from isolated sounds or a rapid sequence of events to a fused texture is the most interesting feature of the synthesis method. All layers were multi-tracked with four simultaneous stereo versions and later up to 32 such tracks were mixed. Considerable use was made of ramps applied to the synthesis variables; that is, certain parameters were made to change over time at a specific rate, sometimes with several parameters simultaneously ramped at different rates. Therefore, all sound in the piece is in a constant state of flux, much like environmental sound generally and water sound in particular. The fundamental paradox of granular synthesis - that the enormously rich and powerful textures it produces result from its being based on the most 'trivial' grains of sound - suggested a metaphoric relation to the river whose power is based on the accumulation of countless 'powerless' droplets of water. The opening section of the work portrays that accumulation, as individual 'droplets' of sound gradually multiply into a powerful broad-band texture. The piece, I find, also captures some of the awe one feels in the presence of the overpowering force of such a body of water, whether in a perturbed or calm state, and as such it seems to create a different mode of listening than does conventional instrumental or electroacoustic music. Riverrun is available on the Cambridge Street Records and Wergo CD Digital Soundscapes, as well as the GMEB CD Cultures Electroniques 6. Riverrun was commissioned by the Music Section of the Biennale di Venezia with the financial assistance of the Canada Council, and was premiered at La Biennale in 1986 as part of the Nuova Atlantide project organized by Alvise Vidolin and Roberto Doati. It was awarded the Magisterium at the International Competition of Electroacoustic Music in Bourges, France, in 1991. All tracks were generated in 4 stereo pairs with real-time granular synthesis (the GSX program) with the DMX-1000, using both fixed waveform and Frequency Modulation (FM) grains (and recorded onto 8-track analogue tape that was later digitized). 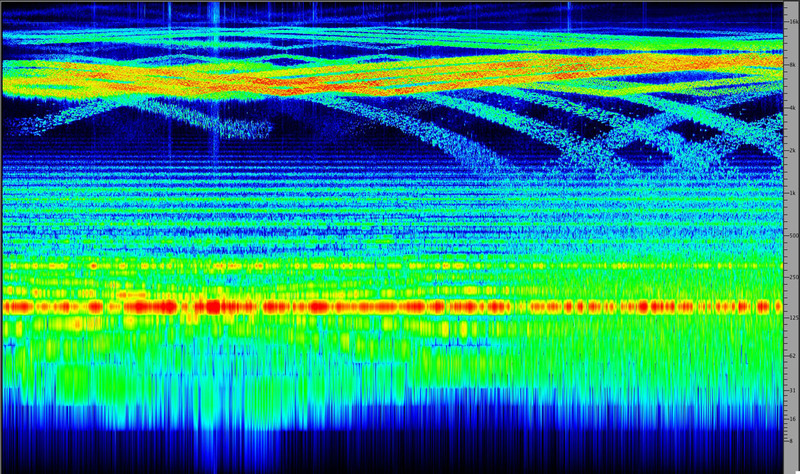 19 separate grain streams of fixed waveform grains (always sine wave), and 8 streams of FM grains were synthesized in real time with grain streams being assigned to either the left or right channels thereby keeping each track uncorrelated with the other. Each FM grain has a C:M Ratio, its own Carrier and Modulating waveform (ones that are not waveform #1, sine, are complex waveforms with a few harmonics around vocal formant regions), and a modulation index envelope that is a simple ramp from 0 to the maximum Modulation Index indicated, and back down in equal proportions. Grain shape is always symmetrical with the default being the attack/decay occupying 1/4 of the grain duration, with that proportion oftened being softened to 1/2 as indicated. Most the dynamic interest in each of the track is obtained by using a ramp on the starting variables indicated in the tables. The speed of the ramp is controlled by the "Ramp" parameter in ms which indicates the time between increments or decrements. The amount of the increment or decrement is the INC variable (which is 1 unless otherwise indicated) multiplied by a scaling factor, e.g. Freq.+2. Ramps can be ascending or descending, and in order to produce an imperceptibly slow ramp, a "random ramp" is used where at each update point a random value of INC is added or subtracted. Hence for INC = 2, the values 0 or 1 will be randomly chosen, eliminating any obvious regular steps. In the table, the number of parameters being ramped and their individual scaling factors are indicated, such that multiple parameters can be simultaneously ramped, in similar motion (+,+) or contrary motion (+,-). A keyboard command (A, D) allowed ramps to change directions quickly, as well as to pause and then continue under manual control. The overall timing of the sections of a ramp are not specifically documented here, but when hearing the resulting track, the moments of change should be audible. Up to 32 tracks were mixed in the Sonic Research Studio at SFU onto 4-track tape in 1986, slightly revised in 1987, and mixed onto an 8-track digital tape in 2004. The use of a digital delay in the early quadraphonic versions (mainly to help fuse the tracks) was abandoned in the later octophonic version. The octophonic playback is distributed around the listener with the channels numbered clockwise. The original stereo pairs occupy alternating, not adjacent speakers. Note: the detailed parameters and soundfiles for each sequence are available on the DVD-ROM. Mara Helmuth, "Barry Truax's Riverrun," in M. Simoni, ed. Analytical Methods of Electroacoustic Music, Routledge, 2006, chapter 8, pp. 187-238 (with accompanying DVD with sonograms, sound examples, etc). Martijn Voorvelt, "The Environmental Element in Barry Truax's Compositions," Journal of New Music Research, 26, 1997, pp. 48-69. Denis Smalley, "Defining Transformations,"Interface, 22(4), 1993, pp. 279-300. Steven R. Holtzman, Digital Mosaics: The Aesthetics of Cyberspace, Simon and Schuster, 1997, pp. 83-84. B. Truax, "Composing with Real-Time Granular Sound," Perspectives of New Music, 28(2), 1990. B. Truax, "Real-Time Granular Synthesis with a Digital Signal Processor," Computer Music Journal, 12(2), 1988, 14-26.